The 50/50 draw number at today’s game against Cowdenbeath was 17205. Prize of £230 for the winning ticket. 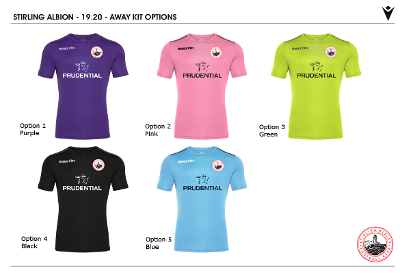 Members of the Stirling Albion Supporters Trust have until this Sunday, April 21, to vote on the colour of the away kit for next season from one of five options. This week’s Albion Lotto numbers are 1, 10, 14, 23. No jackpot winner so next week’s jackpot is £11,600! Barry Cook is the referee for Saturday’s Ladbrokes League 2 game against Cowdenbeath at Forthbank. The assistants are David McKniff and Terry Ormiston. Our U18 side defeated Alloa Athletic 4-3 on Sunday thanks to a hat-trick from Cammy Murray – who was on the bench for the first team on Saturday – and Ciaran O’Donnell. There are no Academy fixtures for SAFC this coming weekend due to the Easter holidays.